Consensus among supporters of Global Warming, aka Climate Change, say it’s settled science. This begs the question: Is science based on consensus? Consensus builders solicit opinions. Debate among the group distills multiple opinions down to one: the consensus of the group. 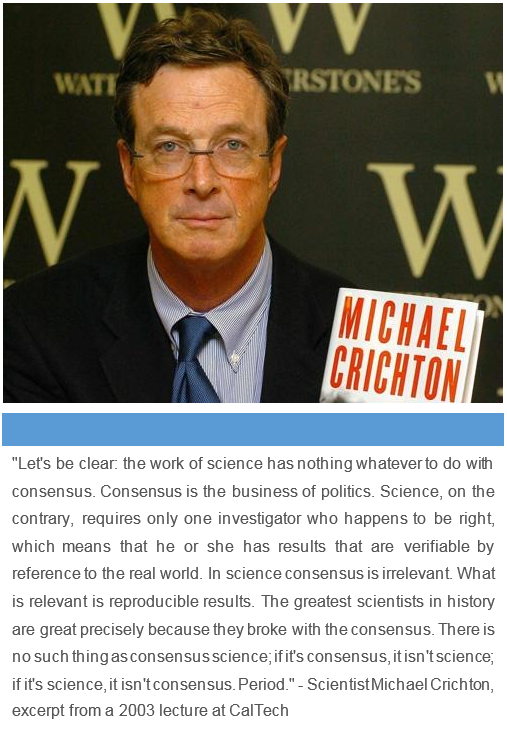 The scientific method is not “group think” – consensus. Scientists generally follow these steps in order to bring to light some mystery. It is the consensus of scientists, politicians and industrialists who have pecuniary interests in proving global warming/climate change that the earth is warming, the carbon cycle is evil and mankind is destroying the earth. Naturally, because this is a greed-motivated belief system, it is inherently a political position and not based on the scientific method. Evidence demands a verdict. Shall we accept the consensus of men like Al Gore who has enormously enriched himself, or shall we follow genuine science? If yes to the second proposition, you have chosen to be a seeker of truth. Next Post Iran Deal? Where is Executive Authority to make a ‘Deal’ in the Constitution?